This month I am indebted to Planet Catfish contributor Dinyar Lalkaka for supplying these great images of his fish. They instantly reminded me of how much I like this species and choosing it for catfish of the month was not a hard step to take. Reading many catfish books you would be forgiven for thinking this is a commonly available catfish. In truth in the 1970's and early 80s, it was a common find in your LFS, but it hasn't been commonly available in more recent years. However, import patterns following their own rhythms, this fish has been turning up here and there recently. Perhaps it will become more steadily available over the next few years, giving us greater opportunity to learn about this pretty mid-sized catfish. Although this species' head is always dark brown to black, the distinctive yellow and dark banding colouration across the rest of the body is variable - as are the exact size, shape and intensity of the dark pigment of the caudal fin lobe blotches. The fish have beautiful crystal blue eyes which are dull, but should never be cloudy in a healthy fish. Keepers of this fish are used to rare sightings especially if kept in a heavily decorated tank. Because the fish is so infrequently observed the aquarist can note significant changes in size and shape. The fish is relatively fast growing, attaining its full size in under two years - given sufficient space and food. Despite the fact it is hard to find a catfish book that doesn't feature this species, surprisingly little hard fact beyond basic husbandry exists. Experiments in spawning are perhaps hampered by the fishes territorial or carnivorous nature, but it is often the case that hardy species are easy to spawn once the secrets are unlocked. The recent spate of imports of this fish allow another generation of catfish keepers to try their hand at this, surely rewarding, accomplishment. Etymology From the Greek pseudos, meaning lie, and mystus, a genus of bagrid catfishes. In reference to the overall similarity of the two genera. Named after its then country of origin Siam (know today as Thailand). 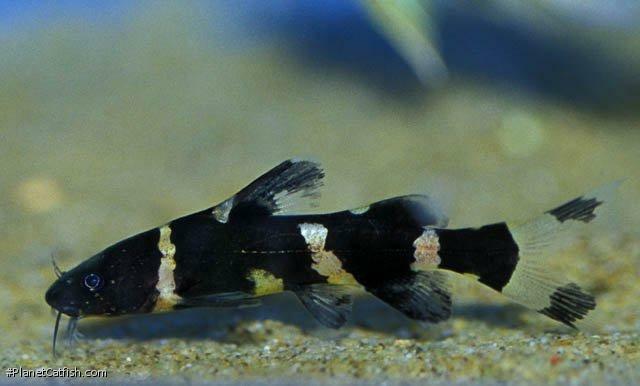 Quite distinctive within its family, this species can be confused with the various South American bumblebee catfish from the family Pimelodidae. All Bagrids, the Asian bumblebee included, have a matched pair of nasal barbels which originate slightly forward of the eyes and tend to run almost vertically upwards. The caudal fin is clear to yellowish with variable blotches in the twin lobes. Sexing Females are more deeper bodied in comparison to the more slender males. General Remarks Intensity of colouration varies with size, age and possibly gender. Distribution Asia: Chao Phraya and Mekong basins. Reported from Mekong, Peninsular and Southeast Thailand river systems. Other Parameters Appears to prefer acidic, softer water but is truly hardy and adaptable in captivity. Feeding A carnivore; this species eats insects and small aquatic crustaceans in the wild but will adapt to most prepared foods easily. Feeding will initially be at night but this nocturnal species can be ''trained'' to eat during the day. Furniture An totally dark cave is required, sized to suit the fish. Long black PVC pipes are ideal, the fish also prefers wood to stone. Compatibility Territorially aggressive to its own kind or similar catfishes although more spacious tanks with plenty of hiding places can house a group of these fish. Tell tale croaking noises through the night belie nocturnal disputes and should prompt the separation of waring faction before too much damage is done. Larger individuals will eat small fish (usually at night). Suggested Tankmates Ideal fish for the active, large Cyprinid tank. Due to its nocturnal feeding habits it suits most American cichlid tanks too, but fry will be eaten. Breeding Only a single documented captive spawning report exists - see Shane's World article. Reports indicate the fishes spawn during the rainy season in the wild, the young being found in fishermens nets around August. References Annals and Magazine of Natural History (Series 8) v. 11 (no. 66), pp 550. There are 81 registered keepers, view all "my cats" data.